MiPOW finally introduces the newest addition to their PlayBulb series, the PlayBulb Candle that will surely not only lighten the mood but also adds up romance in a dinner date. The innovative electronic candle is like no other and there is something in it that seemed serene and fun at the same time, a perfect combination of human emotion and technology as promised by MiPOW. Since it is the latest addition to the PlayBulb Series, you can already enjoy controlling its lights together with the other PlayBulb Series line up. 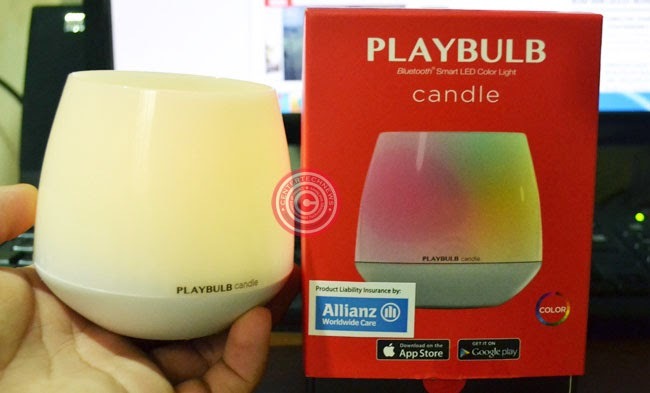 With the use of the free app PLAYBULB X App on App Store and Google Play, you can easily manipulate light colors, dimness and brightness of the PlayBulb Candle with no sweat. It simply means, you only need one app to enjoy as much as five PlayBulb product. Any smartphone with Bluetooth can easily connect with this innovative electronic candle. 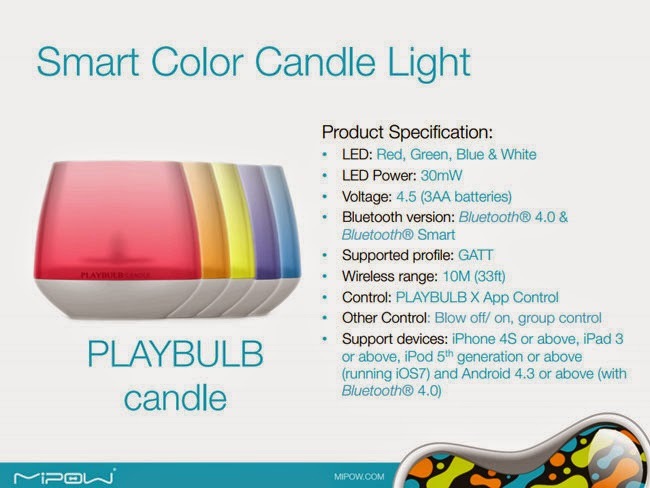 PlayBulb Candle can be controlled via Bluetooth even with wireless range of10M (33ft) through PLAYBULB X App Control. It can be supported by devices: iPhone 4S or above, iPad 3 or above, iPod 5th generation or above (running iOS7) and Android 4.3 or above (with Bluetooth 4.0). Just to be clear the PlayBulb candle is not waterproof but it is still perfect as lights for the bathroom and toilet. When kids are still scared of the dark, a group of these PlayBulb Candles are just right to light up their way to the bathroom. It is so handy and portable you can take it to campings and hangout at the garden. You don’t have to plug it because it is powered by three AA batteries that are easily accessible anywhere. To replace the batteries, twist the bottom and let it detach. To put the bottom lid back, hold the mark ‘close’ in line and the twist it back. Once you turn the PlayBulb upsidedown, it will turn into a real candle holder of mixed modern technology and tradition fit for a romantic dinner. You can blow the light out just like a real candle, only the real candle is more dangerous. Creations of MiPOW won’t just be nice, they are unique and just marvelous. The PlayBulb Candle can turn into scented candle just by putting in Scent Chips in it. Scent Chips comes in three scents: rose, lavender and green tea. Each each is replaceable and can last to up to three months. Don’t worry where to get the Scent Chips because they are already included in the box together with the PlayBulb Candle and a User Guide. For only Php999, you can have the perfect candle safe, efficient and perfect as a nightlight for kids and everyone. PlayBulb Candle is the combination of tradition and technology that can be a splendid gift for the holidays.